We review Harvest Dice, a crop growing roll and write published by Grey Fox Games. While roll and write games aren't going to be generating headlines, they have a dedicated following and we see how Harvest Dice holds up. Roll and Writes are a genre of board games that are never going to get major attention. They are casual games (usually fillers) that, while they have a dedicated following of fans, aren’t going to generate headlines. But that doesn’t mean we can’t still love them. Enter Harvest Dice. I first played this one at PAX Unplugged last year and had a great time. Even after one play, I knew I had to put this game on my list for a deeper dive. Now, having played it a whole bunch more times, I can report if my infatuation with this game is still thriving. 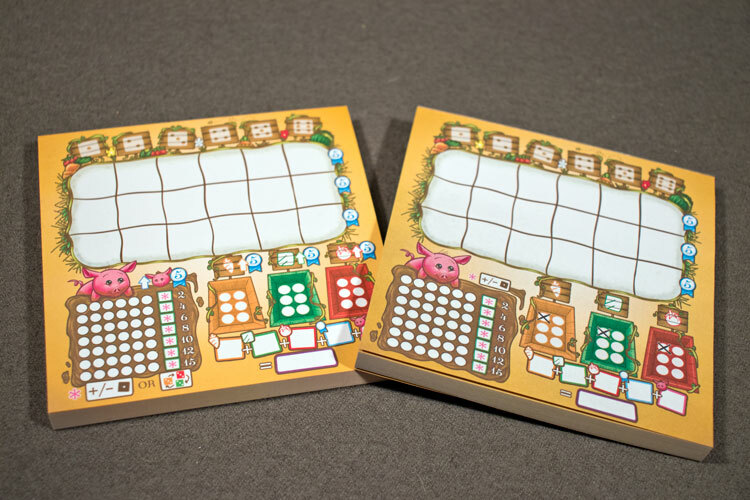 Harvest Dice is a Roll and Write game for 2-4 players that takes about 15 minutes to play. It works well at any player count. 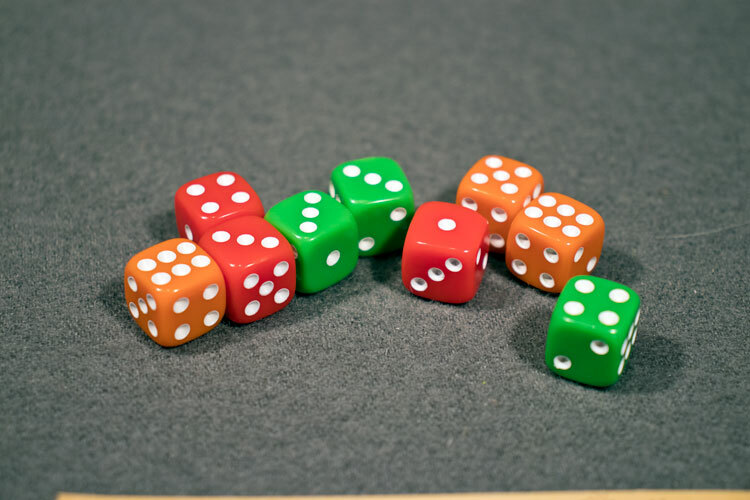 The dice are serviceable, if unremarkable. Custom dice would have been a welcome upgrade. If you can’t place a veggie die, you must feed it to your pig. Cross off as many boxes on the pig chart as pips on the die. 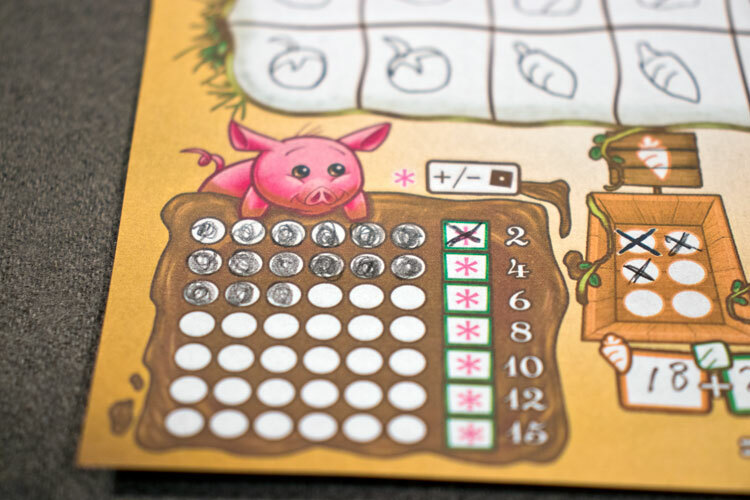 When you finish a row on the pig chart, you unlock a pig power! You can now spend the power to change any die you draft +/- one. When there is one die left in the pool, the round ends. Each player crosses off a circle in the matching market stall. The dice are then collected, the first player token passes, and the process repeats. Once the game ends, players earn points in a few ways. Each crop is scored by multiplying the quantity in a player’s plot by the number of circles crossed off in the market. 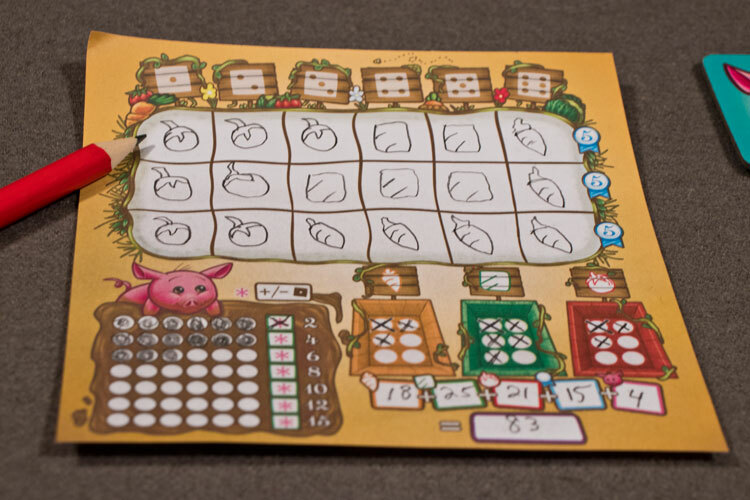 Players also score bonus points for filling full rows on their plot, and for the highest pig row completed. Most points wins. 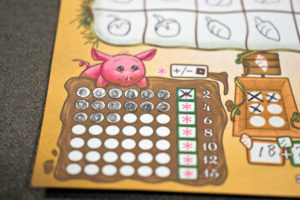 Players must place all veggies adjacent to a veggie of the same type, or they have to feed it to their pig. I’ll just cut right to the chase. I think Harvest Dice might be my favorite roll and write yet. I’ve enjoyed every play of this little gem from the first go, and have yet to introduce it to a player that hasn’t just adored it. Each time you fill up a row, you unlock a use of your pig power. In case you couldn’t tell from the above, Harvest Dice is a very accessible game. The rules are easy to understand and take only minutes to explain. The hardest part is probably the adjacency rule. Yet if you’ve ever had a garden before, it makes perfect sense. I really enjoyed how thematic that rule was. As an avid gardener, just the thought of putting similar crops all over the garden is enough to give me the shivers. Game designer Danny Devine got this one right. I also thought it was a great idea to include a set of advanced rules. This rule set only alters the gameplay slightly, but it does open up not only some more scoring opportunities, but some strategic options with it. Players can now earn points for the most of each type of crop, and also the market stalls start at a value of 0. So you could theoretically have crops that aren’t worth anything (although I’ve never seen that happen). Players can play either the base game or the advanced version. 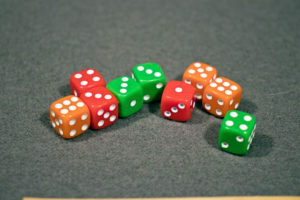 Which brings me to another thing I enjoyed, the dice drafting. I’m a big fan of drafting games in general and it works really well in Harvest Dice. Instead of random pulls from the bag, you have lots of options in front of you and have to decide how best to work your strategies. Players must balance focusing on one crop vs making sure the crop they are focusing on is sent to the market. This also opens up plenty of opportunities for hate drafting, a mechanic I tend to have a lot of fun with. The advanced rules also give you a pig power that lets you change the color of a die drafted. I’ve used that to help manipulate the markets by drafting a color I didn’t want and changing it to one I did. This allowed me to have the dice I needed to go to the market available, and yet still increasing my crops of that type. Honestly, I don’t have much in the way of complaints with Harvest Dice. As a roll and write game, it does everything I want it to do. It’s quick, accessible, scales well, and has you making some meaningful decisions during the game. If there were a knock against it, it would be that games don’t feel all that much different from game to game. But for a $15 filler game, I’m OK with that. 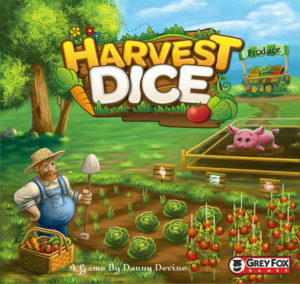 If you are a fan of the genre, buy Harvest Dice. Easily my new favorite roll and write. Final Score: 4.5 Stars – A great, light game that fills its niche perfectly. A must own for fans of the genre. Tony (and everyone else who writes), thanks for the reviews. My game collection has improved by some of your articles and reviews. Any advice for a person who is creating their own board game? Play games. Lots of games. Then play some more. Experience is the best teacher.